Egyptian costumes in 1850. Bedouin, Slave girl and Egyptian woman. Home » Egyptian costumes in 1850. Bedouin, Slave girl and Egyptian woman. Bedouin, Slave and Egyptian woman. Traditional Egyptian costumes in 1850. 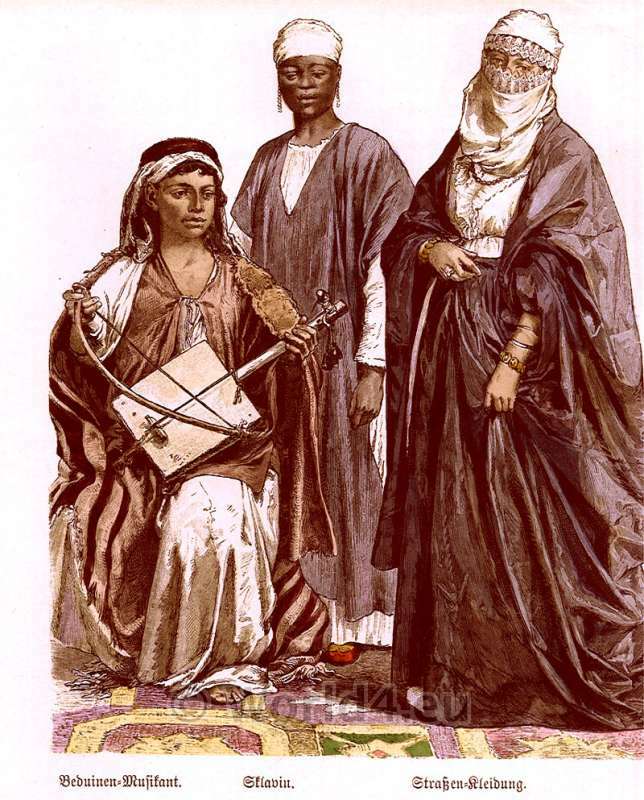 Young Bedouin musican, Female slave and Egyptian woman. A young Bedouin (The name comes from the Arabic, بدوي Badawi and means – not sedentary) with Kufiyya, Jilbab and jacket. He plays the ancient stringed instrument Rababa (Rebaba). In the background is a Nubian slave girl. She is wearing a caftan over a light of woolen dress. Their headdress represents a turban. Right shows an Egyptian woman in street clothes. She wears an ornate scarf around the edges, the niqab, a type of coat-like garment known as the abaya over. This entry was posted in 1850, 19th Century, Egypt, Headdresses, Middle East, Traditional and tagged Egypt, Traditional Egyptian costume on 4/18/13 by world4.